INCUNABLE - Portrait of an astonomer. Title : Portrait of an astonomer.. Size : 2.9 x 3.5 inches. / 7.3 x 8.8 cm. 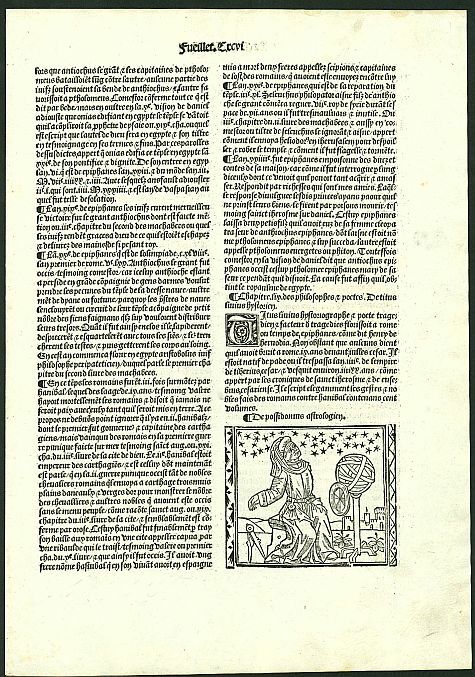 Description :Incunabula text leaf with in lower right corner charming wood block print of an astronomer with a sphere, pair of dividers, etc. looking at the stars. On verso two 5-line initials. Probably from La Mer du Histoire.. . Condition : Size of paper 34x24cm. In very good condition.